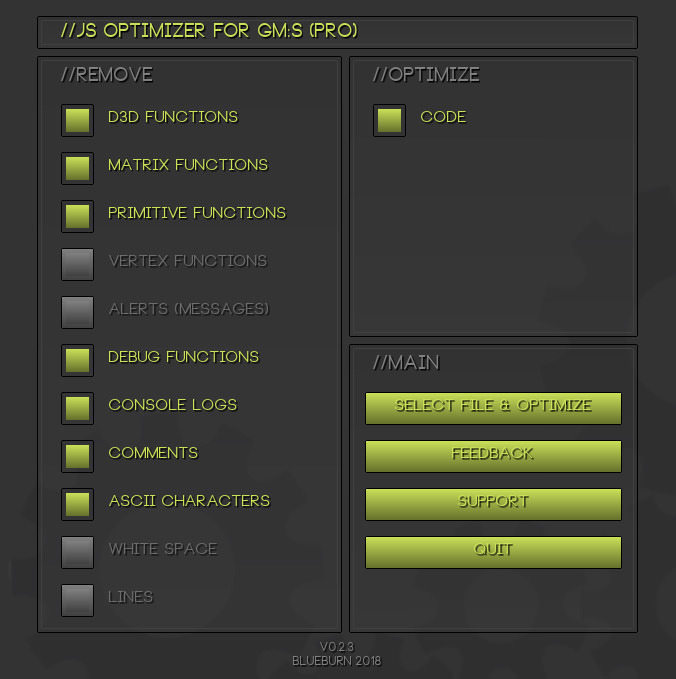 As you may have noticed, after you export your GM:S project to HTML5 and you look into the js file, you can see that there is a lot of unnecessary functions that you don't need so they could be removed, but cleaning it by your hands would be very, very tedious and quite useless, because after the next export you would have to do that again which is unacceptable and so because here is this utility, that cleans it up for you, which is great. It's in early access, but it's already able to remove some unnecessary code from your js that you don't need, and it's also able to reduce and optimize your code to improve speed and reduce loading time. Notice: it's still in developement and it needs a lot of testing, so it's possible that some parts might not work as expected. So if you find some bugs or if you have any suggestions please report it here or to our bug tracker, also you can contact us via blueburn@email.cz thanks! Last bumped by IMP700 on 26 Jan 2018 15:42.